Bad Astronomy: Planetary alignments will cause earthquakes. Good astronomy: Planetary alignments have relatively little to do with earthquakes. 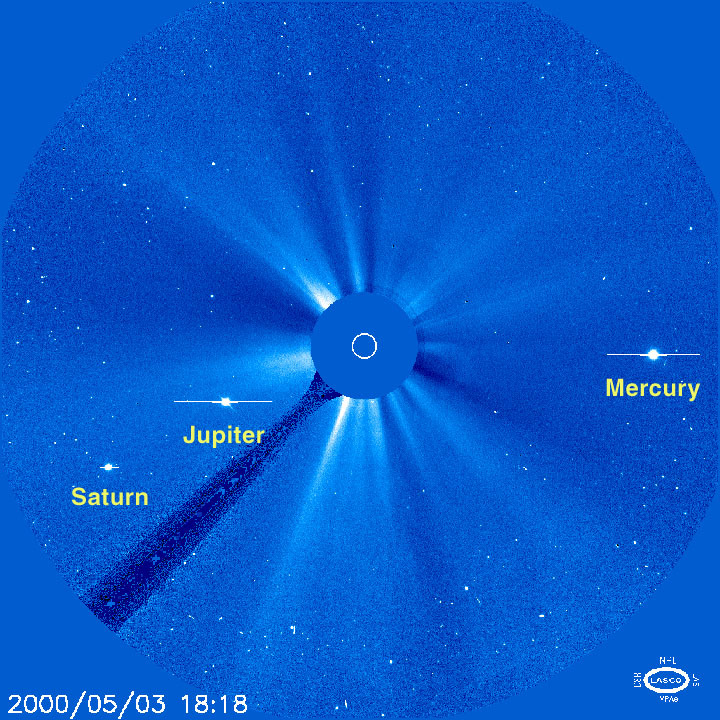 May 3, 2000: The telescope SOHO is positioned between the Earth and Sun, and take images of the Sun continuously. At the SOHO website they have images and animated images of the Sun, where you can see it give off streamers and all sorts of fun things. You can actually watch the planets get closer too as they get ready for the ``alignment''! Go to http://sohowww.nascom.nasa.gov/data/realtime/gif/ and click on the far right image labeled ``C3''; an animated GIF will load and you can see the planets moving. The planets are the bright stars with horizontal lines through them (an artifact of the detection device). The Sun is located behind a mask which blocks its light, and a white circle is drawn where it sits and also shows its size. Check out this image for an identification of the planets in that image. Every few years, doomsayers start popping up and talking about the planets in the solar system lining up. This alignment, they claim, will cause earthquakes, floods and in some cases split the planet in two like a cleaver through a head of lettuce. The last time this happened was in 1982, which, you may remember, is notable as the date on which the world did not end. 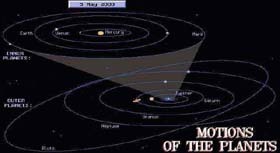 The next alignment, so they say, is in May of 2000. Many doomsayers also point out that that's the year of the millennium (they're wrong, but that's another Bad Astronomy issue altogether)! Are we doomed this time? I have taken on one company that is trying to make a profit from peddling disaster nonsense. I have a page describing what I have done. At first glance, these claims do seem interesting. Gravity is a long reaching force, and the planets are big. Can their influence reach across the solar system and cause all sorts of headaches here on Earth? As always, it is not a bad idea to run a sanity check first. We have pretty good evidence that the Earth has been around a long time, like 5 billion years or so, without being cleft in two. As it turns out, planetary alignments are fairly rare. Getting more than three lined up is difficult; getting them all lined up is rare indeed. But 5 billion years is a long time! Alignments may be rare, but given enough time they do occur, and the Earth is still here. Even more, what most doomsayers say is an alignment is really more of a confluence, or loose gathering, of planets. Some say it is enough to just have them all on the same side of the Sun, which happens pretty often! This is a hallmark of crackpot science: using inflammatory words, then, when cornered, start being very vague and loose with your terms. "Alignment" sounds much better than "loose collection" and "a pattern somewhat weighted towards one side of the Sun", which are more accurate. I think we can rest assured that the Earth will not be destroyed any time soon. Brian Monson has also worked out the positions and times of several past alignments and shows that better alignments in recent history than the one coming up in May of 2000 have occurred with no ill effects. He also has a couple of nice sky maps of these alignments on his conjunction analysis webpage. There is also an excellent page giving great detail about the upcoming "alignment" brought to you by the good folks at The Griffith Observatory, who are also good friends of these Bad Astronomy pages. Yet another page has been set up by Truman Collins as well. But just how strong is the influence of the planets? This turns out to be a relatively easy calculation. (MATH WARNING: for those that hate math, the next few paragraphs may disturb you, but are necessary.) First, let me make something clear: there are two effects a planet can have. One is simply gravity, which basically means how hard that planet can pull on us. The other influence is tidal force, which is more complicated, but you can think of it as a stretching force rather than a simple pull. Think of it this way: a strong enough gravity could pull the Earth from its orbit, while a strong enough tide could rip it in half. Can the planets do this to us? Could they possibly send Earth flying into space, or rend us asunder (quick answer: no)? I will start with gravity, and then show why tides are even less important. Now let's look at tides. Venus stretches us the most of the planets, simply because it is the closest on average. But look! Even Venus only stretches us 5 hundred thousandths as much as the Moon does! This is completely negligible, and the other planets have even less effect. The change in tidal force due to the Moon's elliptical orbit is hugely larger than the combined tides of all the planets. It's worth mentioning that the "alignment" in 2000 has all the planets on the far side of the Sun. This means that you can add 300 million kilometers to the above distances, and I think you can see that the numbers will drop even more. For example, Jupiter's gravity drops from 0.02 to 0.005, and Venus' tides drop by a factor of 500! Note again that the Earth still exists. Feel better now? Of course you do. 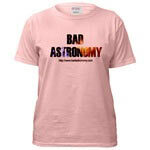 Bad Astronomy, it would seem, has a much stronger influence on our minds than our bodies. Thanks to Bad Reader Mark Thomas for pointing out to me that this page implied that I thought the millennium came in the year 2000. The new millennium starts in the year 2001, and I'll have a page about that shortly. Bad Addendum: There are tons of programs out there on the 'net that let anyone with a computer plot planetary positions over a long period of time. Two good places to start are The Nine Planets Planetarium Software page, and the AstroNet software list. I found two images that already show the planet positions for the two dates. These maps are courtesy of Jean-Luc Romano. Note that in the year 2000 map, there is a loose alignment of planets, but on the opposite side of the Sun, as I noted above. I'd cancel the planetary disaster insurance if I were you. National Solar Observatory/Sacramento Peak Public Relations page has an excellent treatment of planetary alignments in general. The Griffith Observatory page with some alignment numbers like how close the planets will really be in the sky. Truman Collins' page, with some diagrams. Brian Monson's page, which is much like mine, with some slightly different numbers, though we still agree closely. Frank Reed's page has a tidal calculation showing -- surprise! -- that nothing special will happen in May 2000. Donald Luttermoser at East Tennessee State University has diagrams and info too (some of which was borrowed from this page). You are also welcome to check out The Survival Center's Earth Changes Update page, which claims destruction in May 2000. Go ahead and take a peek there, then read a letter I sent them. I don't expect a reply (I never get one from the awful TV show "Sightings" when I take them to task either), but you never know. A lot of pages are springing up with all sorts of nonsense about the alignment. Take a look at The Great Shift of May 5 2000 website as an example of very fuzzy-headed thinking about it (Note: the original page is long gone; the link takes you to the web Wayback Machine).